Mum and Dad can relax in the spa while watching the kids splash about in our two swimming pools (the large pool is non-heated and the small pool heated by electricity). The jumping pillow is great fun for all ages. Enjoy a delicious barbecue set amongst tranquil surrounds. Add that extra tantalising taste with herbs from the free herb gardens. Accommodation is easy with their range of open plan, one, two or three bedroom units, sleeping from two to 10 people - there is something that is right for everyone. For something extra special, spoil yourself with a stay in the Spa Villa with complimentary wine and chocolates! All cabins have reverse-cycle air conditioning. Caravanners can choose from a shady slab site, drive-thru site or enjoy the convenience of an ensuite site. At BIG4 Toowoomba Garden City Holiday Park, you'll find everything you need to ensure an enjoyable and comfortable stay. The popular 3 Berth Cottage is smaller in space but big in value with a massive king bed and one single bed ensuring that everyone will get a good night's sleep with the open plan layout creating all the space you need. The kitchenette facilities are complete with fridge and freezer which ensures no one goes hungry. Equipped also with stove-top and microwave to enable guests to enjoy home cooked meals even on holiday! An ideal choice for smaller, travelling families! This cottage at BIG4 Toowoomba is also a Disabled Assist Cabin with wheelchair ramp access, hand rails and shower chair in the bathroom. Car parking is also conveniently located close to the cabin. Enjoy comfortable accommodation in the 4 Berth Cottage with all the necessities. This open plan cabin has a queen bed and one set of bunks, making it the model choice for families of four. 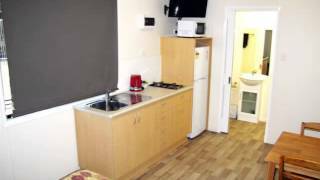 Complete with ensuite and kitchenette facilities including stove-top, microwave and all crockery and cutlery. Some cabins featuring outdoor seating - the perfect spot to enjoy a morning coffee and chat with the neighbours. Guests will feel like this is their home away from home! Do you prefer to have your own shower and toilet right next door to your site? Ensuite Powered Suites are exactly what you need - offering a little extra privacy and space. Fully enclosed Camp Kitchen facilities are available. Relax with a good read when you borrow a book from our free lending library. Add tantalising tastes, whilst cooking in the alfresco barbecue area, using fresh herbs from the free herb gardens overlooking the two sparkling pools. 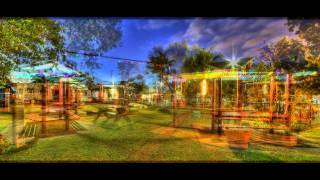 This accommodation is perfect for an overnight stay or for close knit families in need of a holiday park close to all the sights and attractions of the Darling Downs. The four berth cabins have an ensuite bathroom, a main bedroom with a queen bed, and bunk beds separated by sliding doors. 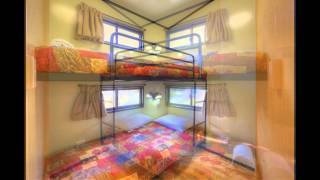 These cabin are self-contained with a kitchenette including microwave, cooktop, cutlery and crockery. All weather types are catered for with the comfort of a reverse cycle air conditioner. Some cabins feature an outdoor seating area overlooking our landscaped gardens. These affordable cabins, sleeping up to four people, are ideal for guests needing somewhere to stay for a work contract or for a short stay in a peaceful location. 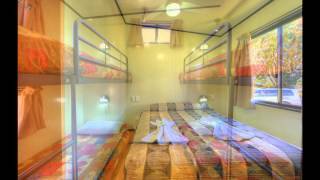 Cosy but comfortable, these cabins are open plan with kitchenette containing crockery, cutlery, stove top and microwave. Please note these cabins do not have a toilet or bathroom however, they are conveniently located close to the amenities block and the other great facilities in the Park. Keep warm in winter and cool in summer with reverse cycle air-conditioning. Choose between a variety of powered sites featuring drive through, concrete slabs or green grass. A site to suit every caravanners needs during a travelling holiday. All sites have access to our great facilities including camp kitchen, alfresco barbecues, spotless amenities and laundry, sparkling pools and relaxing spa. Also available is a dump point facility. You will be sure to enjoy the beauty of the camping lifestyle in relaxed, tranquil surrounds . The cosy spa villa is the perfect accommodation choice for a romantic getaway. Show off your culinary skills in the kitchenette with stove-top, microwave, crockery and cutlery. Everything you need to release your inner Masterchef! Enjoy your complimentary wine and chocolates as you soak all your worries away in the spa....because every day should be Valentine's Day! The villa has reverse cycle air conditioning for guest's comfort - with all linen provided. Spend a relaxing afternoon on the veranda overlooking the award winning gardens and sparkling pools. 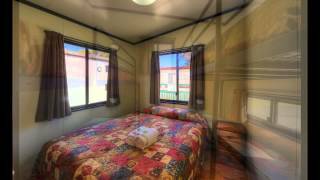 These cabins can sleep up to six comfortably and feature a queen sized bed in the main bedroom and one set of bunk beds in the remaining two bedrooms. With open plan kitchenette and living area there is ample space on offer for the larger family or group. No matter what the weather outside, inside guests can enjoy the comfort of reverse cycle air conditioning. Soak up the last rays of the afternoon summer sun relaxing on the veranda. These cabins, set amongst our award winning gardens, are great for families, three couples holidaying together, or for a family of four including Nanna and Pop too! The eight berth cabins feature a queen sized bed in the main bedroom, a queen bed in the second bedroom that can easily be split into two singles, and two sets of bunks in the third bedroom. Guests can be assured of comfort in winter or summer with reverse cycle air conditioning. The open plan kitchenette, dining/ living area affords plenty of seating for every member of the family or group. Cook up a storm in the kitchen, then enjoy a relaxing alfresco meal on the veranda. If you've got a full house then the spacious and comfortable Three Bedroom 10 Berth Cabin is for you. Being the largest in the accommodation range, it is the perfect choice for big family holidays or visiting groups. The three bedrooms are separate from the living area, so everyone has their own privacy. With the added convenience of two bathrooms, everyone will be happy! With reverse cycle air conditioning, enjoy comfort no matter what the season . With open plan kitchenette, dining/living area, you will feel like this is your home away from home. The main bedroom features a queen bed, and the second has 1 set of bunk beds for the kids. Perfect for the family of four. Cook up a storm in the kitchen or on the nearby barbecues, and enjoy a family dinner on the deck overlooking the beautiful gardens. Watch your favourite television show or movie on the flatscreen television. DVD Player provided as well. Warm in winter and cool in summer, guests enjoy the added comfort of reverse cycle air conditioning. With all linen provided as well, all the essentials are taken care of. These cabins are perfect to come back to after a day discovering Toowoomba and can sleep up to six people so there's plenty of room for Mum, Dad and up to four children. Ideal also for a group of friends enjoying a weekend away. 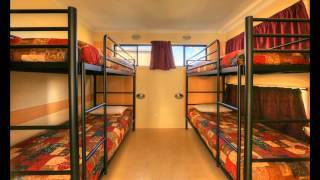 Featuring a queen bed in the main bedroom and two sets of bunk beds in the second bedroom. Enjoy your morning coffee, or alfresco evening meal, on the deck. Features include reverse cycle air-conditioning, kitchenette with stove-top, microwave, crockery and cutlery and all linen is provided. This cosy One Bedroom Cabin sleeps five and features a double bed in the living area and a double/single bunk in the bedroom. Included in the kitchenette is a bar fridge and mini freezer to fit all the daily essentials, as well as a stove-top, microwave, crockery and cutlery. Featuring reverse cycle air conditioning, and with all linen supplied, guests will be comfortable in all weather conditions. The One Bedroom Six Berth Cabin is perfect for friends or families travelling together and is also a Disabled Assist Cabin with ramp access and parking alongside. For convenience, the bathroom is wheelchair accessible with handrails and shower chair. Guests can enjoy the comfort of a king sized bed in the living room with 2 sets of bunk beds in the bedroom - so once the kids go to sleep, the parents can stay up late without disturbing little ones. 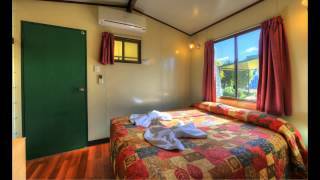 With kitchenette and reverse cycle air-conditioning, this cabin is the perfect choice for your next Toowoomba getaway. These brand new, cosy and comfortable Ensuite Cabins have everything a couple or a single person needs for a quick stopover or a few nights stay here in Toowoomba. 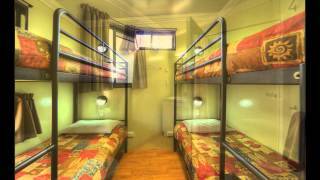 There's a comfortable double bed, table for two, kitchenette and ensuite bathroom. Perfect for business travellers needing somewhere peaceful and quiet to stay. To keep cool in Summer and cosy warm in Winter, these cabins also offer reverse cycle air-conditioning. If activities are dominating your budget, then the great value Ensuite Cabins here at BIG4 Toowoomba are just what you're looking for with open plan living featuring a double bed, bunk beds, kitchen facilities, small fridge and television. 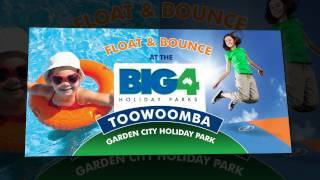 This cabin provides you with everything you need and more and is ideal for a quick stop over or for creating memories in intriguing Toowoomba. The open plan layout features a double bed, bunk beds, a kitchenette, television and DVD-Player. For warm Summer days or cool Winter evenings, guests will stay comfortable with reverse cycle air conditioning. Also offering outdoor seating to enjoy a morning coffee or just to relax with a good book from our small lending library!